Photograph depicts a ship's crew standing in the rigging of a large fully square rigged sailing vessel.Three sailors standing in rigging of a fully rigged sailing vessel. Photograph depicts Hastings Mill.Lumber stacked among warehouses on dock; two, four masted ships behind dock, in centre right of image; Burrard Inlet and North Shore mountains in background. Photograph depicts two sailboats.Two single masted, fully rigged sailboats with crew members on deck; labeled "Navahoe & Valkurie" in bottom left corner, "Baker & Son" in bottom right corner. 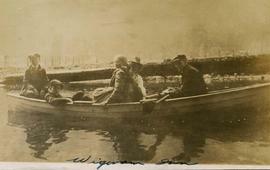 B&W print depicts a group of children in a row boat and one of the boys is holding the oars. "Wigwam Inn" is written on the bottom of the image. 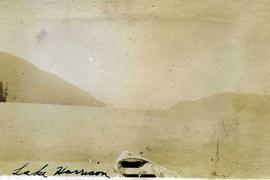 Photograph depicts SV "Annie M. Reid" being towed into Burrard Inlet.Four masted ship with tugboat in front; black smoke billowing out of tugboat; North Shore mountains in background. Photograph depicts the schooner "Everett G. Griggs".Six masted schooner, bow facing left in middle of image. Photographer's depicts a sailboat.Single masted fully rigged sailboat with crew riding crest of small wave in middle of image; labeled "Baker & Son" in bottom right of image. B&W print depicts the front of a row boat with water and mountains in the background. "Lake Harrison" is written on the bottom left corner of the image.Note: colour adjusted on jpg. Photograph depicts "Preussen".Five masted steel hulled barque in middle of image, at sea.